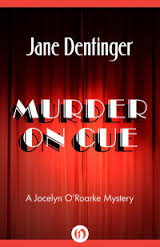 Murder on Cue by Jane Dentinger was originally released in 1992. This book is now in digital format and is an Open Road Integrated Media publication. I receive a copy of this book in exchange for an honest review from the publisher and Netgalley. Jocelyn O'Roarke is called up to be the understudy in a new Broadway play. The cast in the play is plagued by past relationships, jealousy, health issues, and a lead actress that isn't the best actress for the role. When the actress turns up dead, it is determined that it was murder. Jocelyn is the number one suspect since she was the actresses rival for the role. So, Jocelyn sets out to find out what really happened, with the help of a handsome detective. This mystery is written like a classic whodunit. All those associated with play are suspects. This mystery does keep you guessing. Although written a good while back, it's not all that dated, and the setting is fun. For me the only issue was that were maybe too many characters and some aspects of the mystery didn't really come together in the end.